The inimitable Baby brings a humorous spin to the holidays in a cheerful board book fit for trick-or-treat bags. It’s almost Halloween! How should Daddy carve the pumpkin? So many expressions to choose from! What should Baby be—a princess or pirate, ballerina or clown? When the jack-o’-lantern’s ready (looking suspiciously like Baby), it’s time for a little ghost to head out in the slightly scary night. But fear turns to excitement as the pumpkin fills up with treats. WOW! 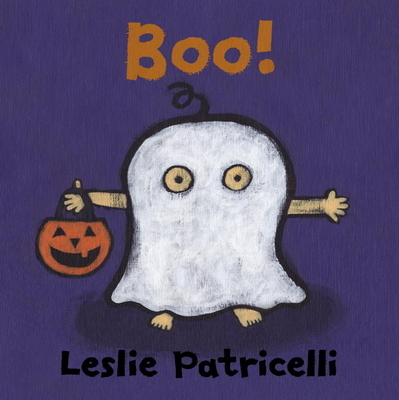 Leslie Patricelli is the creator of a series of best-selling board books starring her beloved bald baby as well as Higher! Higher!, Faster! Faster!, Be Quiet, Mike!, and two stories about the Patterson Puppies. She lives in Ketchum, Idaho. This will end up in many storytime stacks all year long. A warm and cuddly celebration of the creepiest holiday. Patricelli honestly explores the frights and excitements that Halloween first-timers often feel, but she keeps the dial firmly set to fun. The lively color-saturated illustrations play off the simple, direct text, adding humor and silliness to the mix. Two interactive double-page spreads—“How should we carve our jack-o’- lantern?” and “What should I be?”— involve young listeners in the fun and prep newbies for these holiday highlights. Another winner for Patricelli. She has cleverly crafted a tale about a lovable preschooler celebrating another favorite holiday.